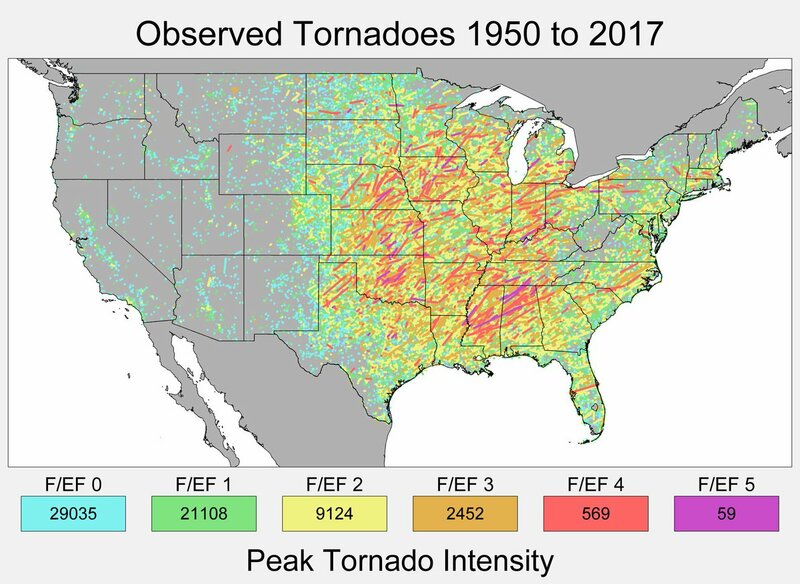 The animation below shows the approximate track and peak intensity of every tornado recorded in the United States from 1950 to 2017. The data is from the National Weather Service's archive of Severe Weather Reports. The frequency of tornados varies strongly with geographic location across the US, with the central Great Plains ("tornado alley") and parts of the Gulf Coast being particularly susceptible. However, tornadoes occur at least occasionally in every state shown. It is likely that some tornadoes that occurred during this period were not recorded due to a lack of trained observers and/or inadequate technology in the local area at the time. Some apparent changes over time may be due to improvements in observational capabilities.